Inspired by Boswell & Johnson's 1773 journey to the Hebrides, Out of Books is an illustrated guide to Ken Cockburn & Alec Finlay's modern-day interpretation. Read- ing the text in landscapes their predecessors described, they will invite people to join them at readings & guided walks. Visiting libraries, they will select books that update the themes Boswell & Johnson mused upon. Finlay & Cockburn's journey began at the Scottish Poetry Library in Edinburgh, on 11 April 2013. 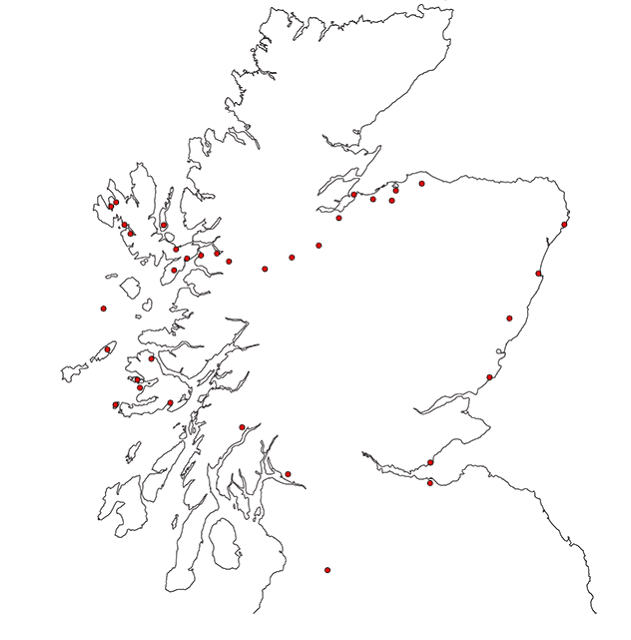 They travelled to most locations between then and 15 October 2013, when they gave a reading at the University of Stirling. In April 2016 they completed the journey, travelling to the Isle of Mull and its neighbouring islands. Select a location on the map to read their online journal. As places are visited, new links will be added. Once completed, the journal will form the basis of ten thematic posts, published late 2013.